The Senate passed a resolution from GOP Sen. Ben Sasse of Nebraska presuming that it is unlawful to bar a nominee from office because of his membership in the Knights of Columbus. The move came after Democratic lawmakers pressed a judicial nominee called Brian Buescher about his affiliation with the knights, a fraternal Catholic charity. Sasse cast the episode as the latest iteration of faith-based hostility Democrats have shown certain nominees. Sasse’s resolution passed without opposition just after 6:00 p.m. on Wednesday, following a floor speech in which the senator extolled the importance of religious liberty. Resolutions of the sort Sasse put forward are generally offered to support non-controversial propositions and are adopted by the unanimous consent of the chamber. “Unanimous consent” means that the Senate endorses the resolution without a vote. As such, Sasse’s resolution was tactically shrewd: passage effectively amounts to a rebuke of Harris and Hirono. Adverse political consequences could have followed had Democrats opposed it. A Marist poll sponsored by the Knights of Columbus released Wednesday found that 85 percent of respondents — including 90 percent of Democrats — said religion should not be a factor when assessing someone’s fitness to serve in the federal government. 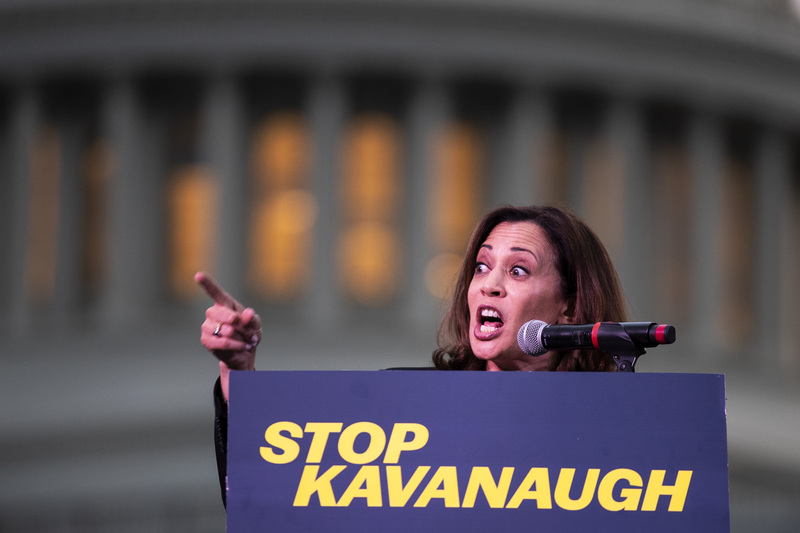 Harris is expected to declare her bid for president in the near future. The senator has embarked on something of a soft launch in recent days, featuring a Jan. 10 appearance on “The Late Show” that left little doubt as to her intentions. The controversy over the Knights of Columbus emerged in December 2018 when Harris and Hirono asked a federal judicial nominee named Brian Buescher about his affiliation with the group in a series of written questions, which followed his Nov. 28 confirmation hearing. The senators cast the knights as an “all-male society” that takes “extreme” positions on social questions like abortion and gay marriage. Hirono proposed that Buescher resign his membership in the group to avoid the appearance of bias. Sasse drew an explicit parallel between the Buescher nomination and that of Judge Amy Coney Barrett who was questioned about how her religious convictions would bear on the discharge of her judicial duties, in view of Barrett’s scholarly writings on that subject as a student at Notre Dame Law School. Those questions were roundly condemned by Christian leaders. Like Buescher, Barrett is a Catholic. She was confirmed to the 7th U.S. Circuit Court of Appeals in October 2017. Buescher is an attorney in the Omaha offices of Kutak Rock LLP, where he leads the agribusiness litigation practice. His nomination to the U.S. District Court for the District of Nebraska is pending.